Powerful machines need powerful controls. Siemens SIRIUS ACT offers a unique portfolio of elegantly designed push buttons, indicator lights, and switches that provide all the performance you are looking for. Constructed with genuine metal and high-grade plastics, engineered with smart functions and communication capabilities, these new push buttons, indicator lights, and switches have been extreme element tested to ensure reliability for your most mission critical operations. 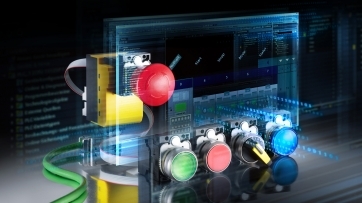 In the food and beverage industry, the sensor switch is utilized. The most important concept for this specific industry is to ensure the highest hygienic conditions. With the SIRIUS ACT sensor switch, companies can integrate a durable, clean alternative to the standard pushbutton in their workplace. Additionally, the SIRIUS ACT sensor switch operates successfully when the user is wearing gloves. Due to the capacitive proximity switch, the human body is used as a dielectric. As the user contacts the sensor switch, the gain in capacitance along the surface of the switch produces a signal. This signal can be used to control machinery or other operations. Learn more about the SIRIUS ACT and features HERE or visit SIRIUS ACT on Siemens website HERE.